Simple Lovely: A Mother's Day Giveaway!! I'm awfully smitten with artist Susan Najarian's encaustic paintings. 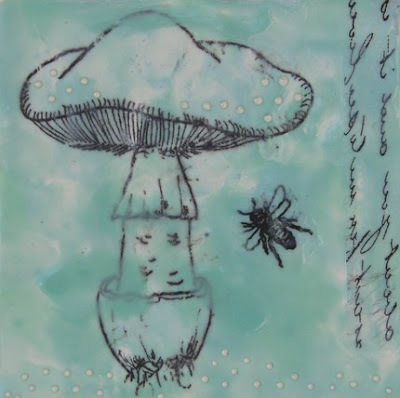 And... she's so generous and lovely that she's offered up her Blue Mushroom piece for a little Mother's Day giveaway! Just leave a comment on this post sharing what you love most about your Mom by 9 pm pacific on Monday, May 4th. I'll randomly pick a winner, and Susan will ship the painting to the winner or winner’s mother gift-wrapped with a cute card on May 5th...just in time for Mother's Day. p.s. for more mother's day giveaway fun go visit doobleh-vay! My mom and I are a lot alike. She's always been an artistic inspiration for me and a great person to listen to my problems. The thing I love most about my mum is the lessons on relationships & life she teaches me everytime we talk. She hasn't been the greastest example of what to do, but she sure has shown me what not to do.. I've had to learn to love her for it. My mom showed me that it's never too late to reinvent yourself by going back to school at 44, and then starting a whole second career! What an inspiration! What I love most about my mom is her willingness to give some new stuff a try. My dad died several years ago and then she retired 2 years ago. When she retired, she really found herself at loose ends. She's really giving it a go though. She's joined book clubs, exercise classes, a weight training study for seniors, crochet classes, an environmental group, a bunco group and a computer club. They haven't all been successful or good fits for her, but she's found some real gems amongst her experiments! My mom is the most generous person I know. I'm not sure that "no" is a part of her vocabulary. What I love most about my Mom is that she always believes in me. No matter what my crazy idea is she is always there to help me make it a reality! My Mom is a teacher without giving "lessons." She imparts her wisdom in the most inadvertent ways, which I love. She has also imparted the most incredible need for creative expression in my life, which serves me so well (when I listen to it). Joslyn, LOOOOVE your blog. Thank you for your inspiration!!! Happy (upcoming) Mother's Day to You! when my mom was little, my grandma used to call her "the savage"... ha ha i guess that comes with the territory when you are the youngest of six kids! she is one feisty, beautiful, smart lady. i want to be just like her when i grow up. My mom is definitely a unique individual who speaks her mind whether you want to hear it or not. I love her fighting spirit. much as it often infuriates me, i love how different my mom and i are. when i'm emotional, she's logical - when i'm panicked, she's controlled. she's the queen of getting anyone out of a jam at any time...it's pretty amazing (and a little bit scary) to watch! What I love most about my mom is her love for my kids. It always makes me nostalgic about my own childhood. Happy Mother's Day to you Joslyn! My mum has raised 3 girls to adulthood and now supports us as we raise our children. My sister just had her first baby with a serious heart defect and my mum has supported her since the first diagnosis and now as her grandson and my sister go through operations and testing. She's amazing. Also she has this totally silly joke about a mushroom - Q. What do you call a mushroom with a long stalk? A. a fun guy to be with. I love my mother's grace and attention to detail. From her care over polishing her silver to shaping our minds, she always does things best and most beautiful. My mom is remarkably practical, in the most lovable way. She possesses marvelous common sense, and what is really special is how hard she worked to pass that along to my brothers and me. I have always felt remarkably prepared to face the world, thanks to her careful tutoring in life skills. Competence and confidence are wonderful gifts! I love that no matter what my mom has supported me and my brother. No matter how harebrained the scheme or crazy the plan, she's there right behind us, often with some constructive criticsm upfront, but never saying I told you so when we fail. I also love that as I've gotten older we've developed a wonderfully comfortable friendship that involves weekend brunch, mini vacations, and making art together. My mom passed away five years ago, and I miss her every day. I have a new "mom" now since my father remarried, and she is wonderful. I am blessed to have two special women in my life! I love that my mom made my childhood magical with a million tiny special moments. i love my mama's strength and sense of humor. i love that she is one of my best friends and i can tell her anything. I love that when I was out with my girlfriends and everyone started to talk about all the things they see in their moms that they don't want to become, all I could say was "My mom is great; she doesn't take crap from anyone, including me - and I love her for it!" So many great comments to compete with. My mom...is...well, my very best friend. period. She knows what I need well before I know. She serves all others before she ever thinks of herself. To my boys, she is the grandmother that can fix anything from torn pants knees to broken hearts. She has always been the same tome. She devotes her life to others. Always. She inspires me every.single.day. The mushroom picture on your post reminded me of her and a recent mushroom hunting expedition where we talked, and hunted, and talked some more. And found great pleasure in a most simple act, just because I was hanging with my mom. I miss my mom. She and my dad were killed in a car accident 18 years ago. I miss her practical advice and "can-do" attitude. She never made me believe for a moment that there was anything I couldn't do. What was important was that I gave something my all, not whether or not I succeeded. Now with my two young boys, I especially miss her presence. i love the look she gives me right before she embraces me with a hug. it's a look that says "whatever you're going through i know you're strong enough to get through it, but just for this moment i will protect you." and then she hugs me. it's the best feeling! no matter how old you are, a mom's hug always makes things better. my mom and i can be 2 hens in a hen house house at times. (at least that is what my dad and husband say) but I won't trade it for the world. i am her and she is me. we get it. she is also very smart and creative. i love her! What I love most about my mom would be her tenacious attitude and warm heart. She has had a rough life, and through it all she overcame obstacles and setbacks, and most importantly made herself a better person because of them. No matter the circumstance, she always offers a helping hand and the best, most comforting hug ever. She is a strong, beautiful woman and I am so proud to be her daughter. My mother is the most caring person I have ever known.She has been the best mother and role model and my best friend. You might say I have been on a journey for the last few years, learning to live without my mother while she is still here fighting the disease of Alzheimer's. Right now what I love best about her is that she loves me and I am grateful everyday that she remembers me still. What a pretty painting! What I love most about my mom is her deep connection to mother nature. She respects all living things and has a heart of gold.